Immerse yourself in Linux but stay in Windows! 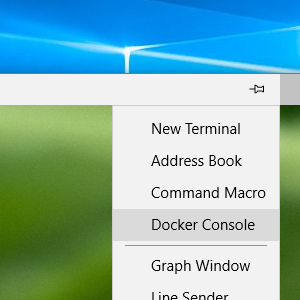 Simply select the Docker Console menu after installing Docker for Windows! Token2Shell will automatically detect the installed Docker server and create a container based on Ubuntu OS. Whenever you open a Docker Console terminal window, this container is used for creating its Bash shell prompt. Not a fan of Ubuntu? No problem! Docker already has many official Linux OS containers such as openSUSE, Fedora, CentOS and Debian that can be used as basis for creating your own container. When you're ready, you can easily replace the default Ubuntu OS container with your own. Manage containers from your favorite Linux! While creating a container for Docker Console, Token2Shell also downloads and configures 'docker' command that can be used for creating and managing containers on your Windows. When you're using your own version of Docker Console, just make sure to download and copy the 'docker' client binary from Docker's repository. Token2Shell also supports directly connecting to a container without installing any additional program; just open a terminal window and select a container! Once you're connected, you can seamlessly configure settings, copy files, check logs and etc. for that container. When you're connecting to a container, Token2Shell also automatically configures the connection to redirect X-Window display output to Windows. So if you need to run X-Window GUI programs from the container, just make sure you have an X-Window server such as our X410 running on Windows. Does your project require servers running on Linux? Get those servers on Docker containers! Since each container is isolated and minimally configured, you should be able to manage or troubleshoot them more easily. Since you can maintain multiple versions of the same server, you can also readily setup servers depending on your project. For example, when you're developing a WordPress theme, you can simply create containers for WordPress and MySQL as their official images are already available. WordPress image includes everything (ex. PHP, Apache web server and etc.) except MySQL. Thus you need to create a container for MySQL and link that with WordPress. While creating a WordPress container, you can mount your theme project folder on Windows directly to WordPress theme folder. Once the containers are set up, you can add or modify your theme files from Windows and instantly check the result from your web browser.